Invest in the immense heritage of Yamaha. The Yamaha b1 upright acoustic piano is the benefactor of 100 years of piano craftsmanship. You can expect the b1 to last a lifetime of music. Resistant to the aging effects of temperature and humidity, the Yamaha b1 is built in a unique, dedicated workshop to the narrowest of tolerances. The b1 is notable for it’s decisive, harmonic sound – you only need hear it to understand the rich nature of its tone. The sound is uniquely Yamaha, the result of bespoke parts designed and built in-house using a one of a kind process. You’ll get the benefit of that care and attention every time you start to play. The rich acoustic experience made convenient. You’ll instantly notice the b1’s bright, engaging sound from the first note you play. Projecting a very ‘focused’ sound, it accurately delivers every note. That means the b1 is a fantastic piano for training or do justice to every song you play. It is the ideal long-term option for a piano student. The b1 is a total joy to play. Yamaha have gone to great lengths to achieve a tactile and highly responsive keyboard action. The nature of the action means you can achieve a huge range of dynamic nuances in your playing. Made up of more than 5,500 unique, custom built pieces the action of the b1 helps you keep a natural flow in your playing. Each b-series piano is created in a purpose-built workshop. Every last detail of construction was designed so that your b1 is effortlessly brilliant every time you start to play. That reliability is all down to the meticulous nature of the b1’s creation. The keyboard is made from solid Sitka Spruce, which is kiln dried until it’s just right. Resulting in keys that go unharmed by the changing conditions the piano lives in. From the moment you press the keys, Yamaha have carefully designed the next few milliseconds. The unique key hammers (which are created in machinery Yamaha custom built themselves) strike the strings. The bridge, where the strings meet the soundboard, is milled Beech hardwood, ensuring that string vibrations are accurately transferred to the soundboard. The sound emanates from the cabinet filling the room with a rich, resonant sound. You can see Yamaha’s obsession with quality is not just on the inside. 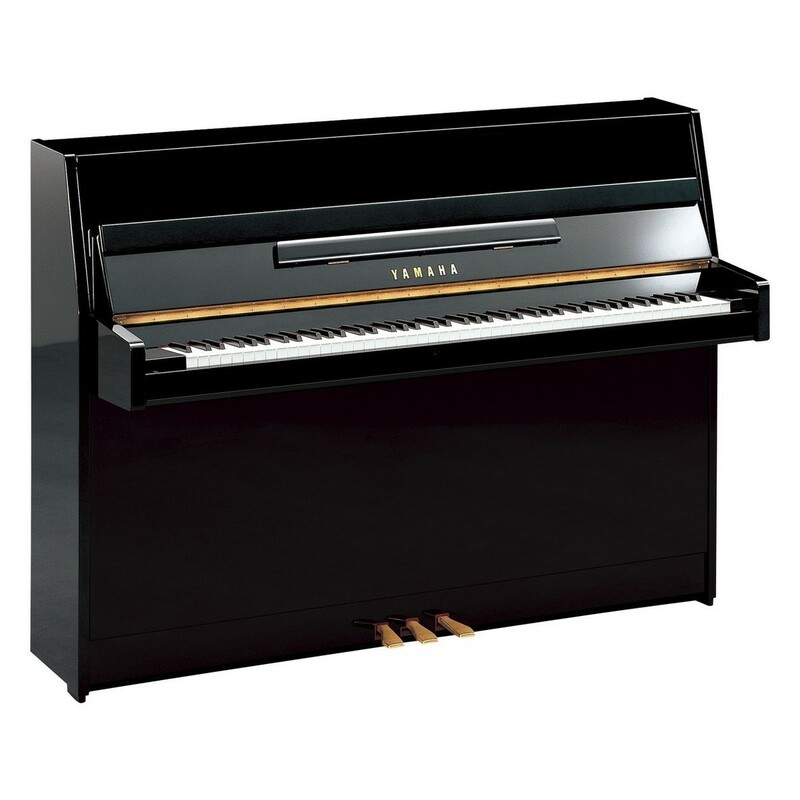 Visually, the black Yamaha b1 embodies the quintessential piano aesthetic. The finish is highly resistant to delamination and colour fading – so it’s going to look great for some time to come. The b1 also features a legless design, which is a slightly more modern take on the upright silhouette. As you might expect, the substantial frame upon which the b1 is built, comes from a unique process. Machined using the advanced ‘V-Pro’ method, Yamaha can more accurately construct the frame - ensuring that your piano will be structurally sound for decades.